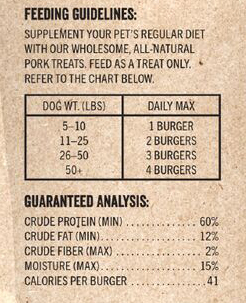 4 Paws Butcher Shop slowly roasts our pork burgers on our open racks which keeps in the natural goodness and flavor for your pup. Slow roasting preserves the meat treat allowing our treats to be taken with you anywhere, without need for refrigeration. It’s as simple as that. • U.S. farm raised human grade pork, vegetables and fruit. We oven roast for hours to ensure that all its natural flavors are maintained.